In a matter of weeks, both the Oculus Rift and HTC Vive headsets will be released to the public, finally delivering on the long-envisioned promise of immersive virtual reality experiences. However, both require a seriously beefed-up PC—not a Mac, either—along with a significant investment, with the Rift priced at $600 and the Vive trumping it at $799. That’s premium VR, obviously. What about the low end? Well, assuming you have an iPhone 5 or newer, you can try out mobile VR using a simple viewer shell, and Google’s Cardboard platform is the easiest way in. Cardboard lets you buy or even build a viewer made of low-cost materials, and then slot your phone in to use as the brains and the screen. And then you’ll hold it up to your face and stare into the future. Or, at least, a pretty cool diversion. Cardboard isn’t anywhere near as immersive or impressive as the Rift or Vive, or even Samsung’s Gear VR headset—but at minimal cost, it’s a neat way to check out virtual reality using the device you already own. Eager to try it out? Here’s what you need to know. Rather than use a dedicated screen and processor, Cardboard relies on an affordable shell with specialized lenses, using your iPhone to do the heavy lifting. Depending on your viewer of choice, the iPhone will either slide or strap in, and then once you fire up a compatible app or game, the image will be split into two halves on the screen. Stare into the lenses and the two images are combined into one immersive, 3D image, and most Cardboard apps use your phone’s gyroscope and accelerometer to let you freely look around the virtual world. Cardboard isn’t a hugely interactive platform, so games are pretty simplistic, but it’s a great way to view 360-degree videos and photo spheres, along with other visual experiences. Cardboard first launched in 2014 exclusively for Android, and as user and developer support grew, so too did Google’s own focus on the platform. 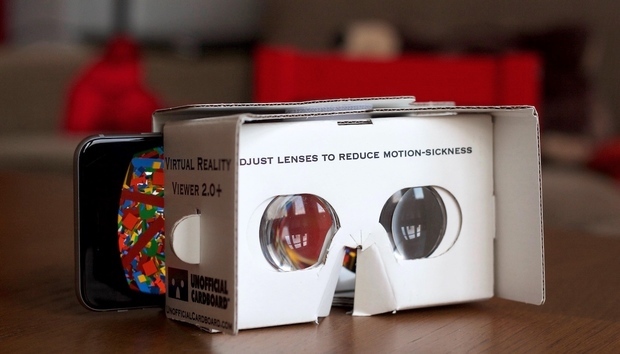 In the summer of 2015, the company released the enhanced 2.0 viewer blueprint and added iOS support, launching the official Cardboard app and letting app makers bring their VR experiences to the App Store. Google’s own Cardboard app includes fun demos, and it can point you towards other apps to download too. The core Cardboard app isn’t required to use a Cardboard viewer—any VR app designed for Cardboard can launch and work independently without Google’s main app installed. However, it’s a nice introduction to the world of mobile VR and has a handful of neat VR diversions to check out, such as a dazzling kaleidoscope and some 360-degree tours of various locales. When Google first launched Cardboard, it had a very strong DIY ethos around it—but then a whole community of resellers quickly spawned around the concept, each offering their own commercial take on the viewer. Google itself doesn’t make or sell Cardboard viewers, but it has given an official “Works with Google Cardboard” stamp to many manufacturers that make viewers of all sorts. The most common Cardboard viewer is, quite literally, made primarily from cardboard. Companies like Unofficial Cardboard ($14.95), I Am Cardboard ($20), and Knoxlabs ($23.95) all sell versions that are mostly similar aside from small differences in build and components. Each comes with the lenses and a conductive touch button, and they’re lightweight and easily customizable. Unofficial Cardboard also has a 2.0 Plus viewer ($19.95) that tweaks the design with adjustable lenses and an optional headstrap. Unofficial Cardboard’s 2.0 Plus viewer adds little tabs for adjusting the position of each lens, but otherwise it’s similar to the standard 2.0 cardboard viewer. We’re also seeing more plastic and foam options, some bigger and stronger than the cardboard viewers and others smaller and more portable. Mattel’s View-Master VR ($30) is a neat option: When I wrote about it for our sister site Greenbot, I praised the sturdy build and comfortable fit against your face, although the latch was a little finicky. Holding my heavier iPhone 6s Plus, sadly, the latch is even more prone to popping open. That’s disappointing, but I still think it’s a good overall option, and an improved second-gen model is coming this year. The ViewMaster VR is sturdy and comfortable, although the clamshell latch doesn’t always hold tight. Otherwise, there’s the Go4D C1-Glass ($15), which snaps onto your phone, or I Am Cardboard’s EVA Foam viewer ($25), which is similar to the cardboard viewers in design. Merge VR’s Goggles ($99) are a much sturdier option with a head strap and an extra input button for compatible apps, meanwhile, and it’s hard to overlook the novelty of the handmade Knox Aluminum VR Viewer ($85), which is only recommended for the iPhone 6 and 6s. Merge VR’s Goggles are pricey, but they come with big perks over the cheaper options. Even with all of those options, you can still make your own: Google provides the plans and points you to places that sell the components—and some sites sell all the non-cardboard pieces in a bundle, like I Am Cardboard’s $10 parts bundle. Just note that it will take a fair amount of precise cutting to get the viewer into working shape. Still, it could be a fun weekend project. Lastly, if you don’t want to buy a Cardboard viewer but also don’t want to make one yourself, keep an eye out for promotional giveaways—they’re becoming more common. The New York Times gave out more than a million free viewers to subscribers last fall, but Verizon also gave away free Star Wars-themed viewers before The Force Awakens came out, and other companies have done similar mass handouts to promote app and media releases. Cardboard has been available for iPhone for a much shorter span than Android, so it’s not surprising that there are fewer overall apps available. Still, many of the most interesting options are available on the App Store, and nearly everything is free. We recently profiled 11 apps worth a look, many of which are focused on immersive news reports and documentaries, as well as photo spheres and other quick diversions. Beyond those, you might also consider Proton Pulse ($3)—a delightful arcade-style brick-breaking game where you use your gaze to control the paddle—as well as Vanguard V (free), a dazzling one-level space shooter demo from the same developer. The Star Wars app offers a series of free “Jakku Spy” 360-degree videos to enjoy in VR. The official Star Wars (free) app also has some amusing shorts inspired by The Force Awakens, while Sisters (free) is an unsettling, albeit brief horror experience. Besides all of those, we recommend hitting the App Store and downloading anything that catches your eye: Again, most Cardboard apps are free and offer compact experiences, so you might as well sample the buffet of VR options. More than five million Cardboard viewers are out in the world now, which means more and more people are checking it out—and more and more interesting apps and games will come, too. Now you can jump in yourself and give it a look, but be sure to check back here in the future, as we’ll be adding more iPhone VR coverage to this hub.